Lagos State Governor, Mr Akinwunmi Ambode has expressed his administration’s commitment to provide critical infrastructure and enabling environment for investors and the private sector to participate in the ongoing efforts to boost water transportation in the state. 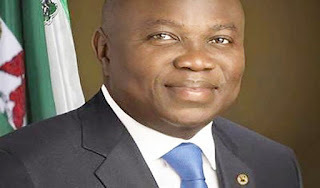 Ambode made the promise at a Roundtable on Water Transportation organised by the State Government under the auspices of the ministry of transportation which held at Eko Hotels and Suites, Victoria Island on Friday. The governor said he wants the private sector to own the state economy because that is the only way to grow the Gross Domestic Product, GDP of the state. Critical stakeholders/strategic partners who were part of the Roundtable include: United Passengers Waterways Association; University of Lagos; The Good Beverage Recycling Alliance; United States Mission in Nigeria, Trade and Investment Department of British High Commission, South Africa government, Paramount Maritime Holdings of South Africa etc. Ambode said though the water transportation sector had been left unattended to over the years it, however, remains critical to solving the traffic congestion problem affecting the State. Adding that the State Government was now committed more than before to fully harness the potentials of the water transportation to the benefit of the people and economic prosperity of the State. The chaotic traffic situation in some parts of the State in recent times and the pressure on the road with attendant danger to lives and property according to him made the need to forge ahead with the reforms in the water sector being championed by his administration even more compelling. So, among the over 22 million people, almost 8 million are walking on the streets every second and at the same time, 86 people enter into Lagos every one hour according to United Nations statistics for 2016 which is the largest in the world. So, if other states are failing, more people are going to be coming to Lagos and that means maybe right now, there are 120 people entering Lagos not wanting to go back and the only mode of transportation we have for them is just the road and that is why we are coming up with other modes. “I was in Apapa and I look at the gridlock and it made sense to me that it is just five minutes ride between Apapa and Marina and so the question is can’t we create barges that take our cars officially and then push them there in just five minutes and so in no time everybody is in their offices instead of going through the traffic?